Every couple of months, we see a trend in the blogger world—from outfit combinations to coveted designer items—that becomes a staple among fashion influencers. From It dresses of the year to specific pieces like this Ganni top, it doesn’t require much scrolling to spot these cult items on a fashion blog or Instagram feed. Today we’re focusing on a simple designer item that has been going for nearly two years now. Hint: It’s Gucci, and it’s not the brand’s fur-lined slip-on loafers. Think accessories—a classic accessory at that. Whether it’s a new or vintage purchase, the latest of-the-moment Gucci item goes to this timeless leather belt. The sleek leather accessory with the brand’s logo as the buckle adds polish to any outfit and makes for a prime IG opportunity. 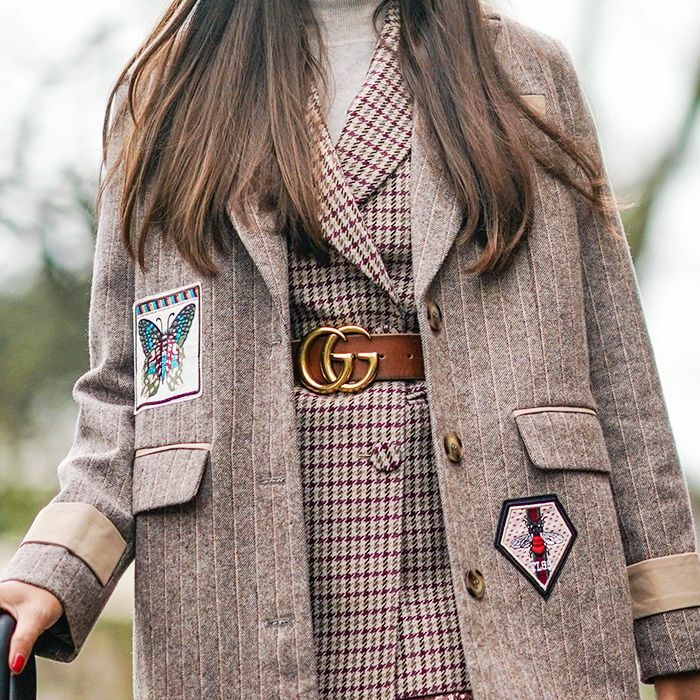 Check out the Gucci item taking over the blogger world below. Style Notes: The easiest way to style the belt? A classic jean-and-jumper combo. Style Notes: There’s something about the toughness of the belt contrasting against a pretty cami that we love. Style Notes: A crisp white shirt looks extra fresh paired with a belt. Style Notes: The blue-on-blue outfit is broken up by the gold of the interlocking G’s. Style Notes: Gucci belt on Gucci jeans? Why not? Style Notes: If in doubt, go for the all-black outfit. Not a fan of the black belt? Try the latest iteration with blue, red, and white stripes. The thinner one is super elegant. A newer version of the now classic belt. Love red? This one is for you. Fret not, the classic is still available. Next up! The biggest S/S 18 fashion trends you need to know about. This was updated by Elinor Block in March 2018.